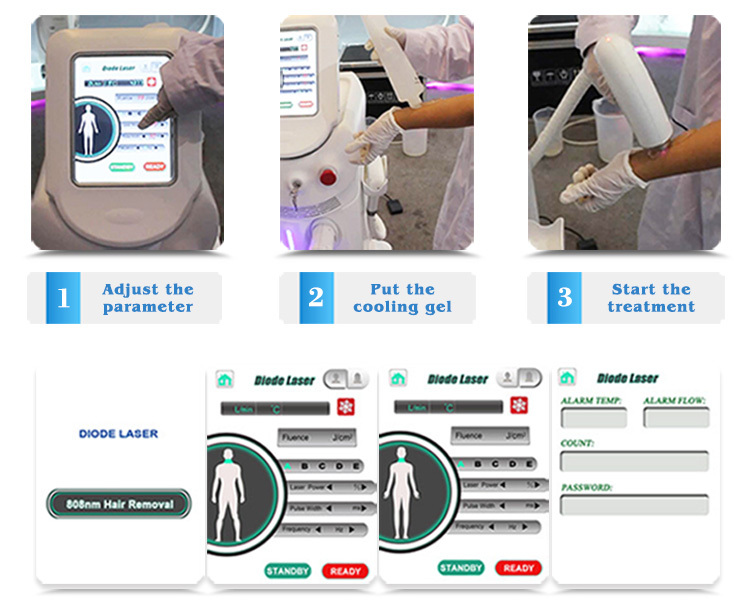 The diode laser hair removal machine system uses the optimal hair removal wavelength of 808nm diode for deep penetration into the dermis where the hair follicle is located.In treatment procedure, a series of low fluence, high repetition pulses increase the temperature of both the hair follicle and the surrounding,nourishing tissue to 45 degree Celsius. This more gradual heat delivery uses the chromophores into the surround tissue as reservoirs to effectively heat up the hair follicle. 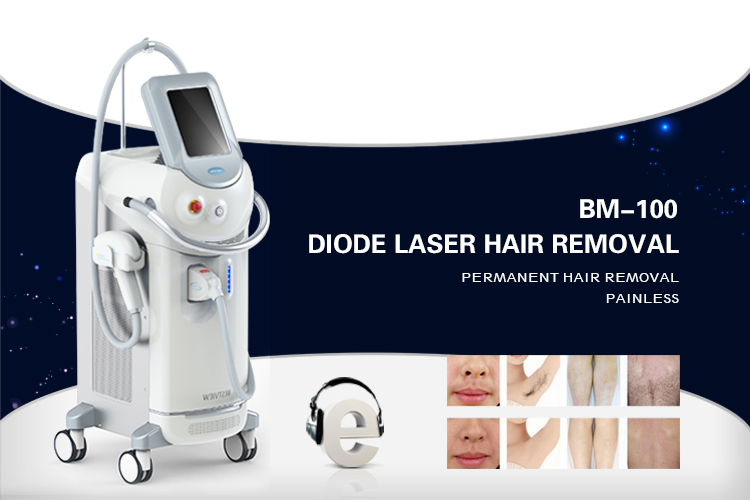 Thus, along with the heat energy absorbed directly by the hair follicle, it can damage the follicle and prevent hair regrowth.808nm diode laser machine is particularly effective to hair follicle melanocytes without injury surrounding tissue. The laser light can be absorbed by hair shaft and hair follicles in the melanin, and converted into heat, thus increasing the hair follicle temperature. When the temperature raises high enough to irreversibly damage the hairfollicle structure, after a period of natural physiological processes the hair follicles will disappear to achieve the hair removal. 7, Two modes of work: female hair removal and male hair removal. ● 808nm: 808nm laser is optimal for hair removal for its least absorption by water and protein, yet most by melanin. ● Imported: The imported semiconductor device has the advantages of stable lasing and long service life. ● Fast: large spot size 20mm x 20mm, high effect and fast treatment in the large treatment area. Not only enhancing efficiency but also eliminating the overlapping defect of traditional circle spot. 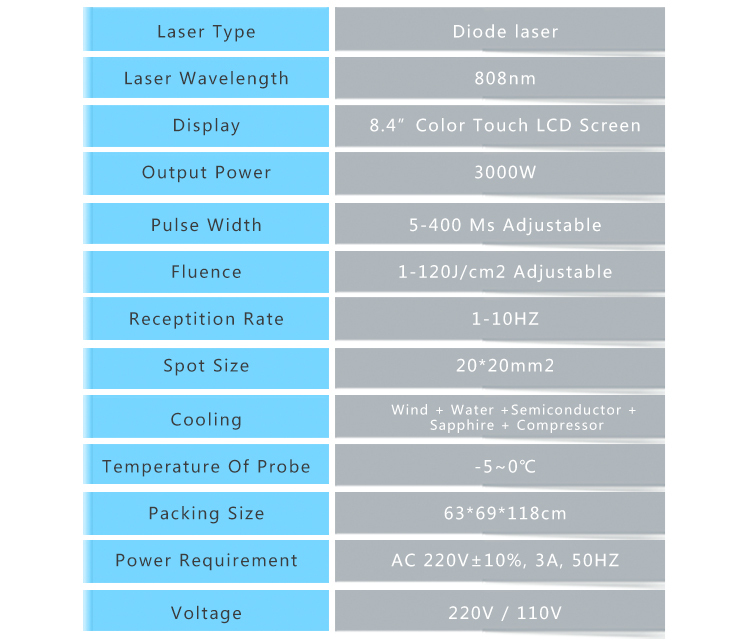 ● No pain: sapphire temperature cool -5 ℃, comfortable for all the treatment. 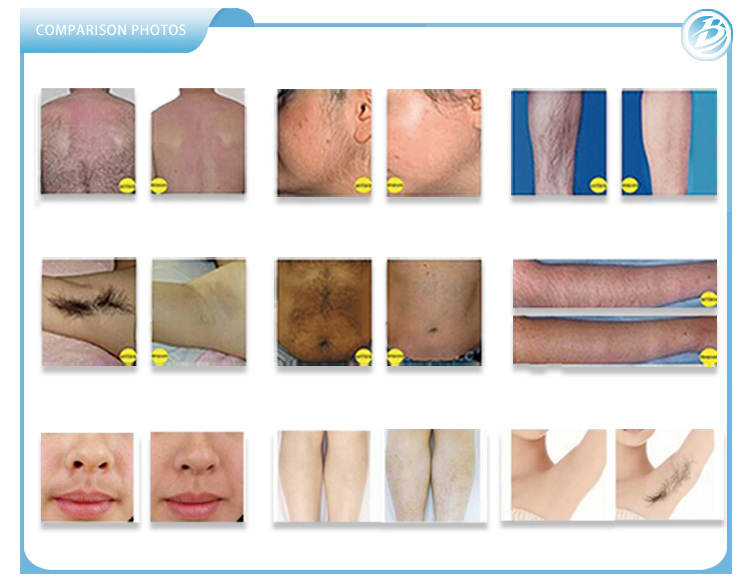 ● Combined: In the process of hair removal, the diode laser equipment also takes effect in skin rejuvenation.